One term you will hear when listening to NOAA Weather Radio, storm chasers, and weather experts during storm season is CAPE. Here is a little about what CAPE is and how it pertains to severe weather. The convective available potential energy or CAPE, is used by weather officials and storm chasers to understand what the potential might be for severe weather, and how powerful those storms might become if they do materialize. The potential energy available for convection is expressed mathematically using a standard measurement of energy represented as Joules Per Kilogram. A high CAPE value might also be expressed by storm chasers and weather experts by using the term “high instability”. When chasers talk about a highly unstable atmosphere, CAPE values are usually in excess of 2500 J/kg’s which would supply ample energy for strong updrafts and violent storms should they develop. More specifically, CAPE represents the amount of buoyant energy available to speed up a parcel vertically, or the amount of work a parcel does on the environment. Storms require high CAPE values; the higher the CAPE value, the more energy available to promote storm growth. CAPE is especially important when air parcels are able to reach the (LFC) or Layer of Free Convection. To find CAPE from a skew-T thermodynamic diagram like the one below, simply locate the area on the diagram where the parcel sounding (Thick yellow vertical line) is farther to the right (warmer) than the atmosphere sounding (red line). The white shaded region on the sounding below is the area of CAPE. the maximum potential vertical speed within an updraft. Faster updrafts means more powerful updrafts. 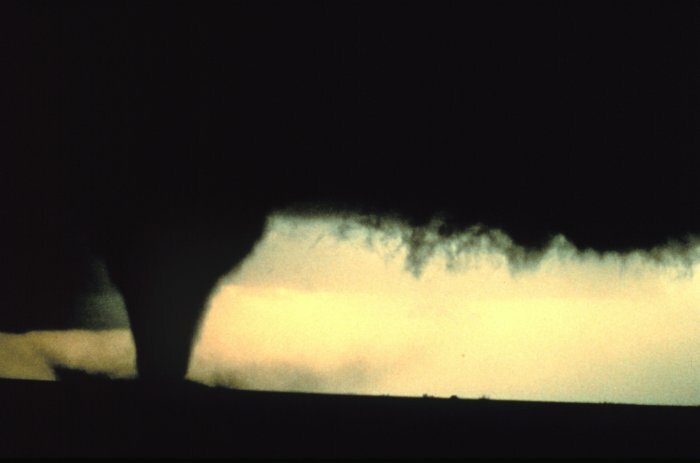 Powerful updrafts aid in the creation of large hail, supercells and violent tornadoes. The chart below can be used to gain a greater understanding of what numerical values of CAPE indicate as it relates to convection of air parcels. Remember, CAPE is only the potential energy. High CAPE values cannot be used as a predictor about whether or not severe weather is going to take place at a given time or that severe weather is looming. It should be remembered that CAPE represents potential energy, and will only be used should a parcel be lifted to the level of free convection. When values are above 3500 j/kg and storms do develop, they may build rapidly and quickly become severe. Often these storms are referred to as “explosive storms” by chasers and professionals. 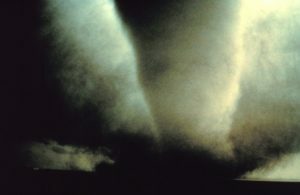 In a high CAPE environment storms that develop can usually be seen by the human eye as rising rapidly. Chasers discussing these kind of storms have been overheard saying these storms resemble a nuclear explosion as in this photo, because they rise up so quickly and powerfully. Joules Defined: Energy here is expressed in JOULEs (J). An energy of 1 joule is expended in moving an object through 1 meter when it is opposed by a force of 1 NEWTON. 1 Joule is equal to 1 Newton-meter. Energy is stored work, Work being the application of a force through a distance. Power is the rate of flow of energy, or the rate at which work is done. Stored energy becomes working energy when it is used. NOTE: To get the full picture of severe weather potential CAPE should be used in conjunction with a full sounding. Also remember that CAPE when used to calculate (Wmax), is often over stated by as much as a factor of 2x. Below is a tornado that Tornado Tim filmed in a high CAPE area over 4000 j/kg.